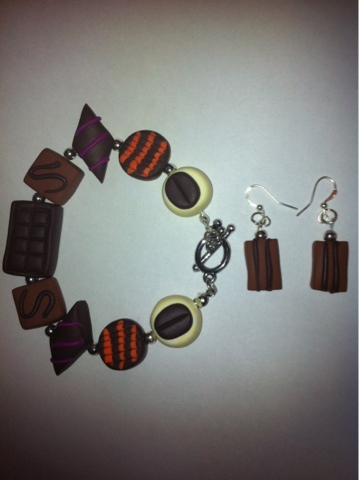 A shout out to Beads &amp; Bobs! So we all know Facebook is a great portal for businesses and finding all kinds of weird and wonderful items. Just over a year ago I connected with a lovely girl called Holly just as she and her mum were in the process of setting up a jewellery business. They started off making bits and pieces for a few of Holly's friends and now a year later they have over 6000 fans! I'm lucky to be able to count Holly as 1 of my close friends and today, just as I was feeling a little blue, the postman knocked the door to deliver a lovely Easter gift from Holly c/o Beads & Bobs. The gift is perfect for me! 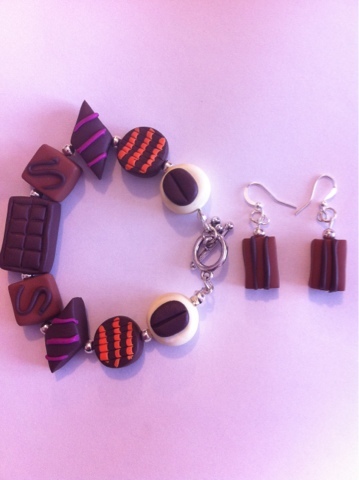 A stunning handmade luxury chocolate bracelet with a t-bar fastening and some drop earrings to match. I say perfect cuz as someone who's (supposed to be) following slimming world non-edible chocolate is ideal. Please do check out their Facebook page.